Rocket fuel for your mind! What Do You Say When You Talk to Yourself? Conclusion: So where do you go from here? Dare to Live Without Limits shows you many ways to take positive control of your life. You will discover techniques and see examples of how others have used simple, yet time tested, methods to triumph over adversity, stress, and misfortune to attain their dreams. The concepts presented within this book enable you to break through those limitations preventing you from achieving your goals and realizing your dreams. 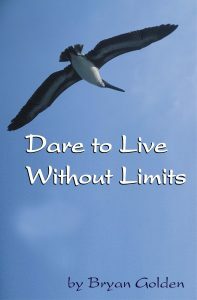 Dare to Live Without Limits is easy to read and to fits into any hectic lifestyle. Each chapter is self-contained and can be read in any order. The chapters are intentionally short and are easily absorbed quickly. As you apply these principles you are in the company of countless people who have utilized them to enrich their lives throughout history. Dare to Live Without Limits is available from any bookstore. Give them the ISBN number (097536880X) or the title. The book provides many ah-ah moments, useful bits of advice you either have not been exposed to, have forgotten or have failed to practice. My favorite Golden words are these, “Developing a sense of inspirational dissatisfaction helps you maximize your potential and stay alert to the multitude of opportunities available.” In other words, don’t get lulled into a false sense of security. Change is inevitable. Be mentally prepared for it. If you’re looking for an easy road, Golden’s book’s not for you. While the chapters are short and easy to read and can be read out of sequence, on a lunch break or while you’re waiting for a train, implementing the words and changing your attitude will take discipline, concentration and patience. But, if you’re intent on changing your situation, this is a good guide book to the road to success. Dare to Live Without Limits: Rocket Fuel for the Mind is a self-help guide written to work with any lifestyle, no matter how on the go, or downright hectic. Chapters show one how to revitalize one’s mind, overcome fear, become more self-reliant, and focus on achieving one’s goals. I found this book to be extremely informative and helpful. It is written in clear, concise terms with many examples of practical applications and is very helpful at pointing out specific ways to look for and focus on the good possibilities in life. It is a potent and timely reminder that we all have the power to change our own lives, right here and now. It emphasizes the importance of channeling our thoughts and energies into positive actions and reminds us that we can improve our daily environment by offering respect and thoughtfulness to others. It also describes the success stories of those who have accomplished great things because they refused to give up on their dreams. I found this book to be a useful and inspiring guide and I recommend it highly to all – it should be required reading! — J.P. I found dare to live without limits, through a local newspaper article written by Bryan Golden. This man is the best shrink in the world. Every sentence causes you to look at your past, present, and future in a new light. The book finds you where you are and takes you anywhere you want to go. A wonderful guide to get rid of hangups, fears, and delusions that may be ruining your life. This book should be read often. — G.Y. This book shows how a little positive thinking can go a long way. And I do mean little. The short chapters make good, quick reading on the go. I usually have five or six books going at once, so that was great for me. My wife picked it up before I was finished and she found it helpful too. — M.B. This is a really good book. It’s chockablock with great advice on living a fulfilling life. It contains practical information on creating a life-plan based on your own goals and interests. I personally liked the anecdotes that told success stories of famous people like the founder of Oscar Meyer. It illustrated how perseverance was sometimes the best remedy for adversity. The chapters are concise and able to be read in a short sitting. And the language, although intelligent and descriptive, gets straight to the point. Golden doesn’t hand you his plan for living a successful life, he shows you how to be the architect for your own life. — A.C. I just regret not having had this book years ago…Bryans’ “ten principles” really help me to change my life. I know what he says is all known and has been advised for years but the way he puts it makes all very simple and very easy to apply. And he really makes you believe in them !! I also downloaded his audio on […] and listen to it everyday. THANK YOU BRYAN GOLDEN. Apologize about english (it is not my first language). — N.F. A great guide. A big message. I found this book to be clear, concise and easy to read. I would consider it a handbook to have on your desk or nightstand. It serves as a reminder that we are what we think about. The importance of being aware of the one thing we can control, our own thoughts and actions. I enjoyed reading the book and will keep it as a reference to look at as needed in my day to day life. I highly recommend this book to all to read and reread. It is uplifting and inspiring. — A.R.